Ode Street Tribune: forgot your car? 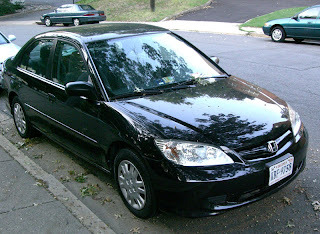 A black Honda LX with VA tags KBF-9758 has been parked on Fort Myer Dr. in front of the Westmoreland Condos since at least Aug. 28. The car received a parking ticket on that date. Unfortunately, its VA tags expired at the end of August. On Sept. 2, it received a ticket as an apparent abandoned vehicle. I'd guess that the car will soon be towed away to an Arlington County abandoned vehicle lot. If you know the owner of this car, I'm sure that he or she would really want to learn about this situation sooner rather than later. Update: The car disappeared a few hours after I posted this. Don't know what happened.